Lexus ProTect is a revolution in car design. Using state-of-the-art technology and materials, your Lexus model can endure the wear and tear of everyday life on the road, while maintaining its exceptional style and functionality. With one application of smart coating designed by NASA, your Lexus has guaranteed protection for a minimum of five years. Innovative - Lexus ProTect is better than the advanced polymer sealants and traditional wax coatings used by other marques, providing a superior protection that lasts longer. Protective - Lexus ProTect works as a shield – guarding the whole of your car’s exterior against everyday damage and wear and tear, from traffic pollution, to all kinds of weather. It can even protect your car from harmful elements such as acid rain and solvents. Through the use of hydro-repellent features, your Lexus can maintain that ultra-shine effect. Guaranteed - Your Lexus only needs one application of Lexus ProTect for five years of exterior paintwork protection – and this is a guarantee. You do not need to reapply or top up each month, and the Lexus ProTect guarantee is passed on with the car if it comes under new ownership. Versatile - Lexus ProTect has many purposes, from keeping a car in pristine condition as seen in the showroom, to using it to refurbish an older model. It can be used to protect paintwork, alloy wheels and even upholstery. Easy - Lexus ProTect is resilient to as many car washes as you desire with a regular wax-free shampoo – you do not need to wax or polish your car thanks to the technology’s ultra-durable protection. 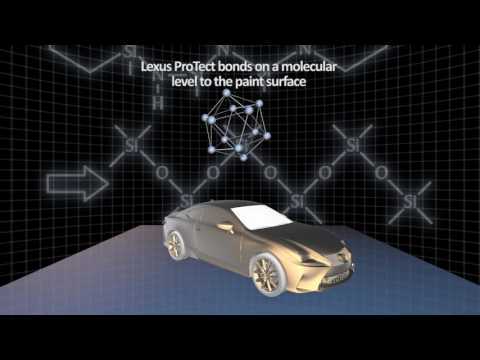 Valuable - As an advanced form of car preservation, it’s worth investing in Lexus ProTect. With a durable, high-quality appearance, it can help to retain the value of your car for resale and part exchange. Pioneering - Using innovative and brand new technology, Lexus ProTect ensures that the outer surface of your car is as resilient as possible, while being able to stand the test of time. A protective coating keeps the paintwork on your Lexus looking as good as new for five years. Benefit from long-lasting protection inside your model, as Lexus ProTect has a hypoallergenic fabric protector, and any dirt or spillages from everyday life in the car can be easily cleaned. It can be applied to interior cloth upholstery, carpet mats and the trunk floor mat. Lexus ProTect keeps your alloys gleaming, and any marks caused by road dirt or brake dust can be easily cleaned.